Community to Community Development hosted the 4th United States Food Sovereignty Alliance National Membership Assembly here in Bellingham October 12-15. Over 120 people participated in the assembly, which gathers every two years to decide the direction of the United States Food Sovereignty Alliance. The participants who came were able to hear about the local context that C2C organizes in. Whether it was uplifting immigrant rights and worker organizing, or building cooperatives and the local solidarity economy, the members were able to get a glimpse of our local struggles. We at C2C were able to hear about the fight for food sovereignty from the different regions of the US, and were able to hear from our international allies. It was important to recognize that the work we do locally is linked to a bigger movement on a global scale — one that is being led by peasants and workers all sharing a common vision. The USFSA presented C2C with a recognition at our organization’s 14th Anniversary Celebration event. The youth of C2C’s Cooking Up Racial Justice program were able to perform a play that they wrote, where they told the history of the Farmworker March for Dignity. It was also an opportunity to stand in support of a group of farmworkers who were on strike that week. The independent Farmworker Union, Familias Unidas por la Justicia, also recognized Benito Lopez for his leadership in forming the union and negotiating a historic contract for farmworkers. Two organizations were also recognized by the USFSA Food Sovereignty Prize: Organizacion Boricua and Black Mesa Water Coalition. Organizacion Boricua shared about the work they have been doing for over 30 years in Puerto Rico and how they have been practicing agroecology. They also shared the challenges that were presented by Hurricane Maria, as well as the strength of their community to rebuild Puerto Rico. Black Mesa Water Coalition shared about how they have been organizing in the Navajo Nation in Arizona. They have been fighting against Peabody Coal and working to reclaim traditional farming practices. Over the three days of meetings and political discussions the alliance was able to create a shared plan of work where artists, farmers, workers, and allies will be taking on a part of the responsibility to advance food sovereignty at the local level and around the nation. You can read the declaration produced in the Bellingham Assembly here. You can read more about the USFSA here. The August 29, 2018 ICE Raid targeting Granite Precast workers was the third major raid in our community, predated by a 2007 workplace raid at Northwest Healthcare Linen and a 2009 workplace raid at Yamato Engine Specialist. As in 2007 and 2009, the families of workers affected by the raid came directly to C2C in the aftermath. However, this raid is unprecedented in a few key ways: it did not take place at the workplace, meaning that the Granite Precast workers did not have a unified experience, they did not know whether they were being singularly targeted, and there were no witnesses. Furthermore, Granite Precast voluntarily participated in the E-Verify program, which is optional in Washington State, triggering the I-9 audit. Following the raid, families have organized and continue to provide for each other the best they can, with the solidarity of our larger community. You can contribute to the Whatcom Community Foundation relief fund here. We have received many questions about the raid August 29th ICE raid where workers from Granite Precast were detained. In an effort to clarify and continue to support the impacted families we met with them and have compiled the timeline below. February 2018: ICE conducts an I-9 audit on Granite Precast in Bellingham due to results of an E-verify scan run by the employer. The list from the I-9 audit contains the names and information of 38 undocumented employees. August 2018: Several employees of Granite Precast note that they are being followed by unmarked vehicles on a number of occasions. August 29, 2018: Between the hours of 4:30 and 6:30 am, ICE detains 16 Granite Precast employees either in their homes or on their way to work. The workers are brought to a border patrol facility for holding in Ferndale. August 29, 2018: C2C is contacted by a family member of one of the detained workers. Individuals picked up have contacted other workers from Granite Precast to warn them about the raid. August 30, 2018: C2C holds a sunrise rally at 6 am in front of the Ferndale Border Patrol. Employees of the facility confront the protest and let them know that the workers have already been transferred to the NW Detention Center in Tacoma. August 30, 2018: C2C holds a meeting for the affected families at the Bellingham Unitarian Fellowship. Questions around bond fees, deportation, and what steps families can take to visit their loved ones are addressed by immigration attorney Hannah Stone. September 1, 2018: C2C hosts a meeting of the families in their office. At that meeting Ruby Castaneda, whose husband was detained in the raid, volunteers to organize the families and assess what their needs are. The organization Raid Relief to Reunite Families is created. September 5, 2018: Whatcom Community Foundation partners with Raid Relief to Reunite Families to support funding for bond and legal fees. September 6, 2018: Bellingham Unitarian Fellowship partners with WCF and RRRF. September 7 - September 24, 2018: Six of the detained workers are released on bond. The fees, which were successively increased from $3,000 to $18,000 each, are covered by donations from the community. The workers released on bond are not allowed to work while they apply for their green cards. During the month of September, eight of the detained workers are deported, leaving their families in Whatcom County without an income. Two of the workers remain in detention awaiting hearings to decide if they can remain here on asylum. Both of those workers are originally from Honduras. October 9, 2018: Catholic Community Services partners with RRRF. Raid Relief to Reunite Families continues to self-organize regular meetings to best address the issues each family is going through, as well as shared meals. They are hosting a community meal open to the public on November 21, 2018 featuring food cooked by the families from Honduras, Guatemala, and Mexico. You can purchase a ticket or make a donation to the dinner here. You can read more about Raid Relief to Reunite Families here. You can listen the leaders of RRRF tell their own story on C2C’s radio show Community Voz here. C2C strives to be a zero-waste organization and build into our movement the practices that will protect the health of mother earth, improve equity and live in a world where we aren’t continuing to discard, use and dispose. In the current extractive capitalist system, we acknowledge the consumption that occurs and all the labor that’s involved with the production of goods we buy and the food we eat. As a farm worker led organization we believe it’s important that we work towards an agro-ecological food system that will honor and protect food producing land. Agro-ecological methods are linked in the efforts of a just transition analysis that shifts the processes to systematically avoid and eliminate the volume and toxicity of waste and materials, conserve and recover all resources and not burn or bury them. Capitalism has destroyed land held as sacred and has forced many communities to live in a state of survival. Implementing zero-waste is part of larger efforts to help reduce climate change, while eliminating the poisons to our waters, air and land that are harming the environment, people, animals and plants. C2C renews our commitment to be zero-waste. Sunday, August 5th will be the re-launching to continue modeling that another world is possible! We look forward to working with our partners in Whatcom County to have all events be ZERO WASTE!! Please be respectful during the march and conscious of your waste. We will have a zero-waste team that will be coordinating the clean-up, but ask that you treat the space and ground we walk on with care. We encourage people to bring reusable water bottles to cut back on the use and disposal of plastic. We are asking people to bring compostable bags for trash collection. Cooking Up Racial Justice is a summer program for youth ages 8-12 that explores concepts of identity, solidarity, and cooperation through cooking, gardening and art. It takes place at C2C’s community garden on East Bakerview Road and at First Christian Church. Kelly Shilhanek, the program's coordinator, offers the following on the program's background and current direction. 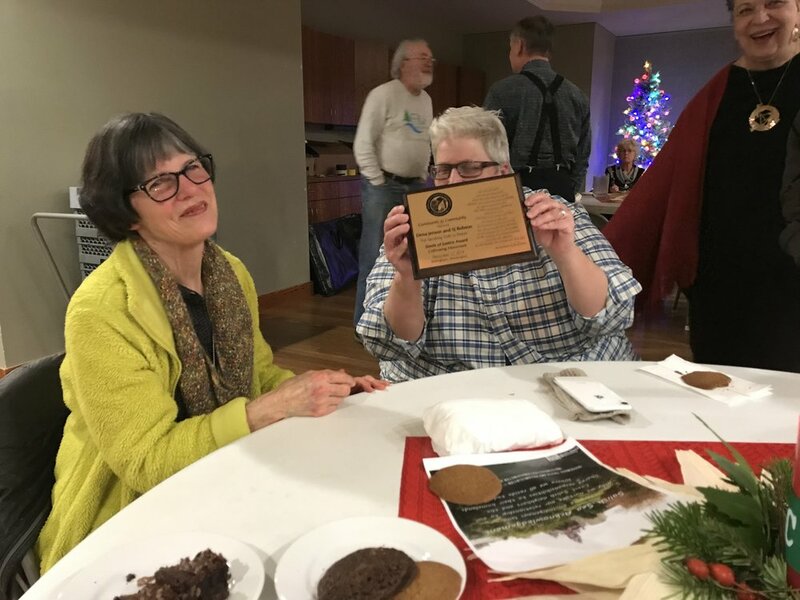 I grew up in Bellingham, and never realized the work of C2C existed (or was needed, for that matter) until 2011, when I learned about the Las Margaritas women’s cooking cooperative, which inspired me to connect with C2C. I was lucky enough to intern for two summers, in which I worked with the youth cooperative and Raices Culturales at their former garden site on Loomis Trail. This experience, and others, reshaped my life and led me to anti-racist organizing, cooking and gardening-themed youth work in Seattle Public Schools, and reimagining my relationship to money and organizing towards wealth redistribution and racial and economic justice with Resource Generation in Seattle. I moved back to Bellingham at the end of March after several months of travel, and sought to reconnect with folks in the movement in Bellingham, including C2C. I feel so grateful for the opportunity to coordinate this amazing project! Cooking Up Racial Justice is the summer program of Raices Culturales, C2C’s historic youth program that originally began as a safe space for children whose families were impacted by immigration raids in 2006 and 2009, at Northwest Healthcare Linen, an industrial laundry business in Bellingham, and Yamato Motors. Raices Culturales (cultural roots, in English) served Latinx youth, predominantly from immigrant farmworker families and other low income working class backgrounds; it became a critical space to explore their identity and build community as Latinos and/or as undocumented youth, as well as participate in fun activities and field trips in the area. After a four-year hiatus due to C2C’s support of the farmworker-led strike and boycott of Sakuma Brothers Berry Farm and organization of the farmworker union Familias Unidas por la Justicia, Raices Culturales is back, with the launch of our summer program Cooking Up Racial Justice (Cocinando con Justicia Racial). Cooking up Racial Justice centers the experiences and the participation of youth from farmworker families but is open to young people from communities of color and low-income backgrounds in Whatcom and Skagit County. Cooking and gardening are used as vehicles to explore campesino agro-ecological knowledge and connect with cultural foods, and as opportunities for the group to practice upholding community agreements and cooperative decision-making. The broader, long term goals are for youth to understand their relationship with each other and with the land as a relationship rooted in care and dignity and in which farm work and the labor of producing food is valued and important! An important component of Cooking Up Racial Justice is the leadership of the Food Justice Fellows, a group of young women from different high schools in Whatcom County that mentor the 14 participants and assist with the coordination of the project. Many were part of the C2C community as youth and are now sharing their knowledge and experience with the younger participants in the program. Additionally, several past participants of Raices Culturales have recently returned to C2C and are now working as promotoras (community health educators) in the farmworker community. We have met twice as a group, and in that short two week span the youth of Cooking Up Racial Justice have collectively drafted and agreed to a set a of community agreements, which includes tenets such as: include others, respect the youth, and treat others with kindness. These tenets reflect C2C's vision that society should arrange its relationships so that everyone has equitable access to the fundamental democratic processes affecting their everyday lives and are antithetical to the many injustices happening nationally and locally, including the separation of families and children by ICE at the southern border and the Supreme Court upholding the racist Muslim Ban, the Bellingham City Council continuing to allow ICE to profile, detain, and terrorize members of our community, and the State of WA’s Dept of Labor and Industries granting Sarbanand Farms a fine reduction, despite finding them guilty of denying their workers meals and rest breaks, which led to the death of guest worker Honesto Silva Ibarra last summer. Last week, participants used these values to create four incredible pizzas, a recipe they voted on to make, using their community agreements to guide them through the process of choosing ingredients, designing the pizza, and selecting names (which included “Basil Flower,” “Family Pizza,” and “Cheesy Pepper Pizza”) as a group. No easy task, considering all of their different taste buds and opinions, yet the result was absolutely delicious pizza, courtesy of the collective vision of 14 young chefs. (Special thanks to Rudy's Pizzeria who generously donated additional pizzas to make sure all program participants were well fed). Cooking up Racial Justice will culminate with two events organized by the youth, one for their families and one for the community. Throughout the program, participants are encouraged to bring knowledge from their families into the learning and conversations we’re having together. The events give youth the opportunity to honor their family traditions and present new learnings. Cooking Up Racial Justice will meet through August. If the youth want to keep gathering, Raices Culturales will continue into the academic year and beyond, with winter programming! Please contact kellyc2c@foodjustice.org or rosalindag@foodjustice.org to learn more, donate to support this important program or sign up your child. Juneteenth is a holiday which celebrates 153 years of African American independence. Black Lives Matter Bellingham will put on the first ever Juneteenth celebration in Bellingham at Maritime Heritage Park on Saturday, June 16th from 4:00 - 8:00 pm. Read more about the Juneteenth celebration here. Below is an interview from Shovia Muchirawehondo, C2C's Legislative Liaison, on the connections between communities who struggle under an exploitative system. I am so excited about Juneteenth. It is the celebration of African American independence which legally began in 1865. From C2C’s perspective, we celebrate this independence and also recognize the connections between the struggles that communities of color are facing. Because we all impact each other: we all have a stake in food justice and labor issues. African Americans have a history of working the land for little or no pay, we came out of that, and now you have the immigrant population stepping into it. So we have a situation of history repeating itself. Land owners don’t want to pay fair wages to farm workers and immigrant workers. C2C supports farm workers in their efforts to grow good food that is free from pesticides, and also to earn a fair wage. Corporate farms abuse their workers not just with low wages, but in all the ways that they treat their workers. You have mothers who are working the farms and being exposed to all kinds of pesticides, families not having the proper space to rest their heads for the next day. All of these things factor into African Americans’ past. So you can see how our society in general has not grown. We have not learned from our past mistakes. We’re still imposing the same abuses, it’s just onto another group of people. And we do still have African Americans participating in farming and receiving low wages and unfair treatment. So these issues are important for anybody who cares about the earth and where their food comes from. In terms of labor, the government is eroding workers’ rights in a lot of ways. The H2A program is an example of how our government sees workers as a resource instead of as human beings. You can also see cheap labor getting extracted from those incarcerated in private prisons. The government uses African Americans and Latinos in our jail system as justifiable slavery. Prisoners are exposed to some of the worst working conditions for maybe a few dollars a day. And it’s all justified. We can’t see them, they can’t see that we’re there for them. So this is a system that our corporate farms create and support. This also squeezes out small farms who are trying to do the right thing and pay fair wages. So, it doesn’t do any of us good. It is eliminating our ability to sustain a healthy world. The exploitation of workers ends in death. That’s what we’re fighting against. C2C stands in solidarity with Black Lives Matter. We will be there on Saturday for the first ever Juneteenth celebration in Bellingham, to show support and to link together what our common fight is. Food justice is an issue that disproportionally affects communities of color. Mass produced GMO foods come into our neighborhoods and we don’t have the economic stability to fight back. Whereas in wealthy white neighborhoods, you can see that people are fighting against GMOs and pesticides where people can afford to stand up for themselves. We don’t have the economic stability to do that. That’s an issue that our black communities have in common with Latino and all low income communities. We are fighting against racism and poverty on all fronts, and you can especially see that when it comes to the food we put on our tables. The Departments of Labor, Agriculture, State, and Homeland Security are coordinating a dangerous attack on immigrants and our food system under the guise of 'streamlining and improving' the H2A guestworker visa program — by expanding and rebranding it as the H2C guestworker visa program. On October 25, 2017, the House Judiciary Committee passed Representative Goodlatte's "Agricultural Guestworker Act" (AGA), HR 4092. The AGA was then included in a broader anti-immigrant bill, introduced by Goodlatte in January 2018: the "Securing America's Future Act of 2018," HR 4760. This bill is one of possibly multiple immigration bills the House of Representatives is planning to vote on in June. Corporations like California-based Sarbanand Farms, growing berries in Whatcom County, with the help of Dan Fazio and wafla, are leading this dangerous shift in Washington State. Fazio is the Executive Director of a farm labor contracting firm now modernized to also act as a WA-based corporate grower lobby association and rebranded as wafla. Wafla is actively campaigning to support the expansion of the guestworker program into H2C, lobbying for the removal of worker protections and providing further incentive to similar employer associations. Their membership is calling their elected officials in support of Goodlatte's legislation. THIS IS THE TIME TO TAKE ACTION! Help us right one of the great wrongs in our food production system. Stop the expansion of H2A in WA State. When we think about the various sectors that exist within the food movement, it can be an overwhelming exercise. There are probably hundreds of moving parts that make up the food system: there are farmworkers, farmers, grocers, cooks, fast food workers, dairymen and women, urban gardeners, fisherfolk... For me personally, it wouldn't have occurred to me to think about the role chefs play in the food system and how much influence they have. The James Beard Foundation is an organization that honors and celebrates chefs and others within the food chain for their contributions and work to make the food system sustainable for everyone. For the past 5 years, they have tried to expand their honors and recognitions beyond just chefs and restaurants, which make up only a part of the food industry. These leadership awards have begun to honor those who are doing significant work in different sectors relating to equity in the food system, such as policy-making, business, and, more recently, labor and social justice. President of Familias Unidas por la Justicia, Ramon Torres, was one of the honorees for the 2018 James Beard Leadership Award due to his continuous efforts from the early stages in 2013 to the formal establishment of the first farmworker union in Washington State in over 30 years and the boycott of Driscolls, which led to the negotiation, in 2016, of one of the best contracts for farmworkers in the country. Recognition by professional chefs of farmworker-led organizing is particularly significant considering the political climate farmworkers are living in at this time. Racist groups and racist policies make life difficult for farmworkers — this is compounded by the exploitative labor practices of the agricultural industry and the industry's false claims of a farmworker shortage to justify displacement of local farm workers as corporate growers opt for a neo-slave workforce under H2A contracts. In the summer of 2017, C2C and Familias Unidas faced down a corporate farm responsible for the death of one of 675 farmworkers brought in under the H2A program to work at Sarbanand Farms in Whatcom County. It was an interesting experience to see people's reactions at the awards ceremony as they heard a farmworker speak truth, whether about poverty, pesticides, or child labor. With this award, a space has opened for building an alliance that moves beyond cooking and eating at high-end restaurants, stocking food banks and more towards a solidarity framework. We hope there can be more collaboration between chefs and farmworkers in achieving justice for farmworkers and the many other exploited workers in the food chain. In recognizing Ramon and the union, the award is also an achievement not only for the farmworker movement, but the labor movement. Some of the lowest paid work is in the food industry. It is also an industry where many immigrants work. Food worker organizing is fought at every corner and union-busting is rampant, but this recognition of Familias Unidas is an opportunity to begin a dialogue about bringing justice throughout the food chain, in which workers are seen as being as important as chefs and the people that consume their culinary creations. C2C says YES! On I-1631! Our food system and farm workers are being impacted by climate change every day! The article by Jeff Johnson below originally appeared in the Stand. Dignity Vigils began in February of 2017 in response to Bellingham City Council ignoring community members who asked for a real Sanctuary City ordinance to be passed. Instead, on February 13, 2017 Bellingham Council passed an ordinance that does nothing to protect affected communities. Every Monday, community members come together to stand in solidarity with undocumented and immigrant families and people. In addition, we come together to stand against law enforcement and federal immigration collaboration which leads to deportation. You can find more information on Keep Bellingham Families Working here. The following post was written by Dena Louise in response to the 63rd Dignity Vigil. 63 weeks of Dignity Vigils and Bellingham City Council Member Dan Hammill was present for his 3rd out of those 63. 63 weeks of Dignity Vigils and the Bellingham City Council has still not strengthened the ordinance that shoved aside the Keep Bellingham Families Working Ordinance that had been created to effectively protect our immigrant and undocumented community members from persecution. 63 weeks of Dignity Vigils and there is still no citizen oversight to help ensure that no collaboration between local law enforcement and Immigration and Customs Enforcement (ICE) occurs that can result in the persecution of immigrants who are our community members and neighbors, persecution that can include repeated and ongoing: general harrassment, investigation, court dates, apprehension, separation from family members, indefinite incarceration, abuse within immigration prisons, and/or deportation. 63 weeks of Dignity Vigils and Google searches on ICE yield pages upon pages of fresh news everyday about ICE destroying lives of immigrants and their friends and families and community members all across the nation. 63 weeks of Dignity Vigils and Council Member Hammill wants to know what vigil attendees want, after all the comments and petitions and letters and face to face input that Council Members have received since November 2016 (that included many which directly addressed specific changes sought to the Council's ordinance that the Council voted to approve on February 13, 2017) and have continued to receive for the weeks and weeks and weeks after the Council voted to adopt their ordinance. 63 weeks of Dignity Vigils and Council Member Hammill says he is attending both as a public citizen and as a City Council Member and wants to know what we want without offering any indication he is attending Dignity Vigils with the intent to take action upon his constituents' needs. 63 weeks of Dignity Vigils and fresh in our memories is Council Member Murphy walking by vigil attendees two weeks earlier and angrily blowing off the offer to give her a flyer about issues effecting farm workers. 63 weeks of Dignity Vigils and fresh in our memories is Council Member Lilliquist walking by on the 62nd week of Dignity Vigils, passing by the assemblage of community members, passing by the altar to honor Cesar Chavez on the anniversary of his death, passing by with no words or actions of his own to show respect for this great defender of immigrants and farm workers. 63 weeks of Dignity Vigils and fresh in our memories is the absolute absence, week after week, of Whatcom County Council action to adopt an ordinance to protect members of their community who are immigrants and undocumented, a refusal to act which has been especially memorable after we community members approached them in the summer of 2017 asking them to propose an effectively protective ordinance. 63 weeks of Dignity Vigils and, yes, still fresh in the memories of we community members who came to meet with City Council Members and present the Keep Bellingham Families Working Ordinance, is the work group meeting 61 weeks ago where our ordinance was shoved aside in favor of one proposed by the Council, the workgroup where assurances were made that a forwarded copy of the Council's draft ordinance would be sent for we community members to review before the Council presented their ordinance for a vote, that draft copy finally arriving at 3 p.m on the day that Council Members voted unanimously to approve the Council-created ordinance that shoved aside our ordinance. "Community to Community Development and the Whatcom Civil Rights Project have been, for years, bringing complaints, bringing evidence, talking to the Whatcom County Sheriff and the City Council and other Council Members, telling them that there was continuous, ongoing racial profiling happening. And from this racial profiling, other exploitations grew. And it was ongoing, and it was institutionalized, and we were volunteering and offering our support to change this. "And it built up, and built up, until the moment when we had enough support to write and present an ordinance, a legal document that was the beginning of a possible dynamic change within this government to protect these communities in the right way, in the proper way, in the dignified way, as the way our country is supposed to function. These democratic systems are supposed to function to represent us! "The City Council and the County Council are not clubs. They're not social groups. They are not bureaucratic mechanisms to implement bureaucracy already written into city governance. They are not administrators. They are not like county clerks. They're not supposed to be a submissive agent of the Mayor or the County Executive or the County Prosecutor - handing them a document and they say, 'this document is written this way, implement it.' No! They are elected leaders from different districts, elected by voters to represent, to bring to the city government the issues that matter to their constituents, and even possible solutions to what is happening in the neighborhoods and in the different districts of the city." "Kelli Linville..., we talked to her and said that the Bellingham Police Department, that there are officers in the Bellingham Police Department that are racially profiling people, and she immediately jumped and said, 'No! There is no racial profiling in the Bellingham Police Department.' And we said we have people that have suffered that racial profiling based on color, especially brown people who are immediately identified as undocumented and ICE is called. She said, 'No, that does not happen in my Police Department.'" "We stand by our belief in our position because we see it happening, that this is a white supremacist government. We don't believe that every single person in this building, working in this building is a white supremacist or racist, but the leadership has developed an institutionalized, a culture that dehumanizes the most vulnerable in our community. At the core of everything is a dignity of every single person in this city and the respect that we demand when we bring our complaints, and the dignity within the solutions they give us, not the disdain that we have been shown." Community Voz is C2C's ecofeminist radio show, coming to you from the Deep North in the Pacific Northwest, presenting the grassroots work that local people are doing across intersecting movements. Our radio shows are engaging conversations about issues and news you probably won't hear anywhere else, including white supremacy, racism, settler colonialism, and patriarchy. We believe in community radio and alternative media, which highlights the character, beauty, and courage of the voices of people on the ground that need to be shared with everybody. As the organizers and activists on our show come from impacted communities, you will hear multiple, varying voices each week. Community Voz is facilitated by Junga Subedar, co-founder of the Racial Justice Coalition (RJC) and is often joined by Rosalinda Guillen (Community to Community), Michelle Vendiola (Red Line Salish Sea, RJC), and Maru Mora Villalpando (Latino Advocacy, NorthWest Detention Center Resistance). Thank you for tuning in! The April 4th Community Voz radio discussion, Part 3 of the "No Way to Treat a Guest" series, centered around a number of dates significant to the labor movement in our country, which include the birth and death of Cesar Chavez, along with the 50th anniversary - on the day of the broadcast - of the assassination of Dr. Martin Luther King Jr. Guests discussed their reflections on the contributions of these men, the reasons they were under attack while they were alive, and where the labor movement is at today in terms of protections for immigrant workers. The show was hosted by Junga Subedar; featured guests were Rosalinda Guillen, Executive Director of Community to Community Development, Michele Stelovich, President of the Northwest WA Central Labor Council, and David Bacon, a renowned photo journalist and immigrants-rights advocate. The seemingly impossible struggles of brown and black workers to obtain safer working conditions and reasonable pay prompted Chavez and King to be on the frontlines in their defense. King's support of striking black sanitation workers in Memphis, leading up to and including the day of his assassination, occurred during the same period that Cesar Chavez was immersed in organizing and empowering the strike by Filipino and Mexican farmworkers against grape growers in California. Thanks to those like King and Chavez who put their lives on the line, and brave workers who stepped forward to join together for their rights, much was accomplished to protect workers' safety and rights. Today, most Mexican farmworkers in Washington state are completely unrepresented by any union or bargaining organization, which leaves their destiny almost exclusively controlled by whatever corporate farms they are employed by. In the last few years, under the H-2A visa program, the importing of workers from Mexico has increased dramatically. As these workers are so overwhelmingly isolated from the surrounding community on the sole farm they can work for while they are in this country, they are at much greater risk for abuse than other farmworkers. Learn more by listening to the show here. YES on I-1631: Protect Washington Act campaign launch tonight! The YES on I-1631: Bellingham Launch is tonight, Thursday April 19, from 6:30-8:30 p.m. at BUF! For the last three years, C2C, as part of Front and Centered, alongside labor unions, business, and environment, health, and faith organizations, has been building the Alliance for Jobs and Clean Energy—the most diverse and inclusive coalition in Washington State working on climate justice legislation. The result of this collaboration is I-1631, the Protect Washington Act. We, Community to Community Development, Racial Justice Coalition, Latino Advocacy, Familias Unidas Por La Justicia, and the Red Line Salish Sea, wish to provide some perspective on our discontent with the Bellingham MLK event. For the last two years, impacted people and grassroots groups held space for a counter event, protesting the city’s annual MLK celebration. The counter event was intended to expose the city’s misuse of Dr. King’s birthday and messaging for their own benefit. The counter event was intended to protest the city’s abuse of power in policy-making which has detrimentally impacted the poor and people of color. The city’s actions are antithetical to Dr. King’s values, and one wonders if their MLK Jr. event is even ethical. Before and since the first day we stood outside city hall and everyday with everything that we do, we honor Dr. King’s legacy through the actions and work of grassroots movements. Dr. King fought for Black people, people of color and the poor. He fought against capitalism, U.S. militarism and racism. Dr. King did these things by taking to the streets and marching, using direct action and civil disobedience, implementing boycotts, and demanding accountability from unjust and racist institutions. He inconvenienced people when it was called for, and ultimately sacrificed himself for the movement. We continue his work and the work of so many other social justice warriors of our past. We stand on the shoulders of our social movement leaders, we honor their memory and we will not stand by when their efforts are co-opted by the systems of power they worked to dismantle. This past year, people of color in Whatcom County have faced many corrupt policies and attacks from local government, elected state officials and law enforcement that seem to take their lead from the trump administration. For example, law enforcement officials have bullied social movement leaders, attempting to criminalize their work, and corrupt officials have trampled free speech, one of the highest constitutional rights of our democracy. There have been continued unchecked racial profiling by law enforcement, furthering the agenda on the war on immigrants and people of color today. Additionally, the city voted to uphold racist landmarks and refused houseless people their basic human needs and shelter, just to name a few. Despite all the attacks, we will continue fighting for liberation and we will persevere. Nonetheless, it takes everyone’s commitment to see the pressing issues, solutions and voices to be heard. We believe that no work can happen without impacted communities leading the work. Nothing about us without us. Grassroots efforts are working to redefine power and decision-making. We are inviting the community to attend the People’s Movement Assembly (PMA) that exemplifies participatory democracy on Sunday, January 21st. We will collectively answer, what issues we face, what the solutions are, and what actions we are taking. The PMA will take place from 9 am-5 pm at the Bellingham High School. So join us and the movement for people. The solutions and power are in the grassroots movements of today. We stand on the shoulders of Dr. King’s legacy on his commemorative 89th birthday. We feel his spirit and take guidance, even today, from him and many of our social justice leaders. Our historical mentors live in our spaces, vigils, demonstrations, boycotts, and actions. Our community will continue to fight for Indigenous people, people of color, immigrants, the poor, and the most marginalized in our community, as Dr. King and other leaders of the past have done for us. In closing, we ask you to critically examine the current political environment and the city’s actions, and please consider not attending the city’s MLK event. C2C is working to become a self-governing solidarity economy center fostering political movements that define their own agenda towards the creation of a local solidarity economy. This is a video of Kali Akuno of Cooperation Jackson in Mississippi. This is a great interview that explains Cooperation Jackson’s work and political positions. For C2C the most inspiring part is at the 23 minute mark, when he focuses the discussion on the solidarity economy and how they envision building it in Jackson. Cooperation Jackson is one of several sister organizations to C2C. We also envision a solidarity economy in the North West! At C2C we propose that instead of replicating an economy that is built and centered around individualism and competition, we need an economy that centers Mother Earth, cooperation, and solidarity. An economy that is responsive, plural and sustainable for all. We call it the Solidarity Economy. The Solidarity Economy model works, it is real, we have seen it function for working people in Brazil. The Landless People's Movement in Brazil has shown us that it is possible for workers to control the resources and wealth their labor creates, protect Mother Earth and share with those in need. Capitalism continues to fail our communities. A recent article in The Guardian clearly depicts the reality of over 40 million people in the US and the untold masses from around the world that are struggling to live a dignified life under neoliberal capitalism. It is important to point out neoliberalism because it is the strain of the capitalist economy that now rules the majority of the world, where everything is a commodity. As Farm workers and eco-feminists we believe there are no disposable humans in our communities, we all are deserving of basic human dignity and Mother Earth needs our stewardship. Capitalism has defined who we are as a people by telling us who is worthy of a decent income, housing, food, wage, etc. This is just wrong! 1. SIGN: Washington registered voters need to sign the petition and return the petition to De-Escalate Washington. 2. VOLUNTEER: All of us need to gather signatures from registered voters. Anyone is eligible to gather, even kids! HOW: The petition is a legal document and is not on-line. The paper petition must be signed, and returned to the campaign. Each petition has space for 20 signatures. You can mail a petition back with just one signature, or you can ask other Washington registered voters to sign. We have petitions available or you can request a petition by texting Request to 1.206.202.0461. Or fill out a form online: http://www.deescalatewa.org/request and a petition will be mailed to you. WHEN: Do this now! The petitions should be returned as soon as possible. The campaign has seven weeks left to gather the required signatures. It is going to be tight and every signature you gather is important. RETURNING THE PETITIONS: There is an address printed on the back of each petition. Fold the petitions in half, and thirds, stamp them, and drop in the mail. Washington State law on use of deadly force by police is the worst in the nation. We are the only state that has a de facto immunity in the law that is a barrier to prosecution. Our law has a complete defense so that law enforcement are not held accountable for unlawful deadly force. Since the law was passed in 1986 there have been zero convictions for unlawful use of force by police. Last year in Washington State police killed 29 people. This year, 34 people have been killed so far. About one-third of all persons killed by police are experiencing some sort of mental health crisis. Initiative 940 is an initiative to the legislature. If enough signatures are collected it will go to the legislature. The legislature can pass it, do nothing, or propose an alternative. If the do nothing, it goes on the ballot in the general election in November 2018. If they propose an alternative both I-940 and the alternative go on the ballot. We need to get 259,000 signatures of valid registered voters by December 29, 2017. We are aiming for over 300,000 for a margin of error. investigations; it requires that Tribes be notified of and be included in investigations when a tribal member is injured or killed; and it requires that community stakeholders be included in policy making. The initiative specifically requires input from organizations advocating for: Persons with disabilities; members of the lesbian, gay, bisexual, transgender, and queer community; persons of color; immigrants; non-citizens; native Americans; youth; and formerly incarcerated persons. Washington is home to one of the biggest detention centers in the country (Northwest Detention Center) and a border state. For these reasons, the increases to immigration enforcement funding that Trump's administration is pushing for will undoubtedly harm immigrants in our communities. The ending of DACA and the recent national “Operation Safe City” through which ICE detained more than 450 people, including 27 of our Washington residents, are yet more examples of why we must oppose any increase in immigration enforcement funding. sign-on letter. We ask that our allies and partner organizations join us and sign on! The deadline to sign on is TOMORROW! November 8th. Tomorrow is also the national call-in day. immigration enforcement system. We demand that [Senator/MoC] publicly call for significant cuts to ICE and CBP and be a voice within [chamber, caucus, with leadership] to Defund Hate and oppose funding for the detention and deportation machine." On November 8th, Detention Watch Network will do national call-in day coordinated with a Thunderclap. What is a Thunderclap? Thunderclap allows a single message to be mass-shared, so it rises above the noise of your social networks. By boosting the signal at the same time, Thunderclap makes a significant impact on the social media landscape. Jose Manuel Carrillo for Detention Watch Network if you have any questions! Familias Unidas por la Justicia (FUJ) members turned out Thursday night to overwhelmingly ratify the tentative collective bargaining agreement presented by their negotiations committee. After an overview of the contract the Mixteco and Triqui hand harvesters, men and women, lined up to cast their ballots. Official vote counters Jeff Johnson President of the WA State Labor Council and Steve Garey former President of the Steelworkers Local 12-591 tallied the vote and announced it was over 85% in favor of ratifying the tentative agreement. Sakuma Bros Berry Farm and Familias Unidas por la Justicia’s representatives signed the collective bargaining agreement Thursday afternoon making it official as of today. "This is a historic victory for all our members that harvest berries, they are happy to be working at Sakuma Farms with a union contract, everybody is ready to get to work, there will soon be union berries in the marketplace!" C2C would like to thank all our supporters, volunteers and members who enabled us to walk in solidarity with FUJ over these last four years. Because of you we are one step closer to a food system that is fair, just, and healthy for all people.